Historically significant drinking and traditional Irish music establishment, O’Donoghue’s Pub, located at 15 Merrion Row, Dublin 2, Ireland, near St. Stephen’s Green on Dublin’s south side. 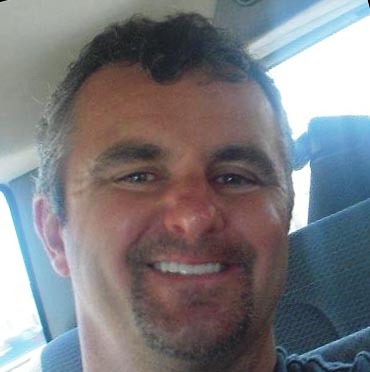 And we hope our Man in Dublin, Carl Hylin will bring us more first hand reports on the Dublin music scene and his other adventures in Dublin. The Cobblestone, is described by publican Tom Mulligan as ‘a drinking pub with a music problem‘, is a highly recommended traditional Irish music bar and venue. Literally everyone we asked, “Where is the Craic“, from Ray Yeates, the City of Dublin’s Arts officer, to our taxi drivers, recommended the Cobblestone. We stopped in late on an April Saturday afternoon, and listened to the last half-hour of the Old-time session as well as the first part of the first Trad Session of the evening. Fiddler Dermy Diamond of Belfast lead both, and the place was absolutely packed, with punters literally shoulder to shoulder. Luckily, Tony was able to secure a couple of pints at the bar, so we were not left high and dry. Click Here for a video sample of the session! The Mulligan family have been playing Irish music for five generations, no one can remember back any further. Tom’s laid back and friendly pub is built on family tradition as well as respect for the full range of music and culture. Besides the Irish Traditional music and song, The Cobblestone also features Irish Sean-nós singing and dancing, set dancing, céilidh, American Old-time sessions, history talks and more. We visited this vernerable Pub on a Tuesday in late April at the invitation of Patrick Good, a long time friend of Michael Black, who lead a 4 hour long session that was about 3/4 Songs and 1/4 Tunes with a half-dozen musicians participating. They were all very engaged with the general clientele, and Patrick spoke directly with them throughout the evening, sprinkling in stories, jokes and taking their requests. In the photo at left, the musicians (They all demurred from being included in the photo) are just out to the shot to the left, as they sing ‘Happy Birthday’ for one of the regulars. 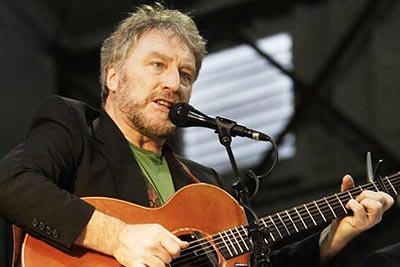 Included among them were three former members of the famous Irish band ‘The Dubliners‘, whom Tony and I had the pleasure of hearing perform both Songs and Tunes as well as meeting them. Some of the mandolin work was amazing! To cap the evening, Tony sang ‘The Old Dun Cow‘, which none of them had ever heard before, but still, the entire Pub was soon singing the chorus, ‘There was Brown, upside down, lapping up the whiskey on the floor’, and shouting ‘McIntyre’! at the top of their lungs! Throughout the Dublin session scene, we found that every session is unique in how the music is organized, and simply a reflection of the management and clientel’s preferences. Despite what you may have heard, been told, or found in some book, there are no set ‘Rules of Session Etiquette’ that we found in any of them. Traditional Irish musicians in Galway are very fortunate to have many pubs hosting sessions, two to three times a day, seven days a week. These are frequented by the best musicians from Galway and all over Ireland and the world. 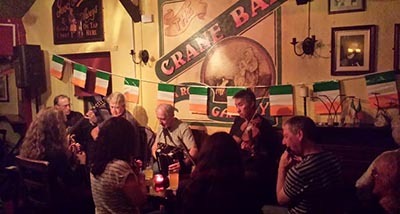 Most pubs that host trad music are within a fifteen minute walk from city centre, and all sessions are ‘open’ sessions, though they are not described as either open or closed. All sessions in Galway are ‘open’ to anyone who already knows how to play the music. Local musicians know when and where the sessions are, and are always welcome and supportive to anyone else who wants to join in. Visitors who know traditional Irish music and play at the level of the session are always welcomed. A set of tunes from another country, another culture, are always encouraged. Most of the sessions I personally attend are mainly for traditional tunes, with only an occasional song. There are singing sessions for those who prefer to hear mainly songs, and anyone may participate in them by singing and playing. There are also swing, jive, jazz, contemporary rock and country music, not open to visiting musicians, but usually with dancing. There are also monthly Ceili dances at the Claddagh Hall with Set Dancing and the best of live Irish Ceili bands. Sessions are controlled by a session leader that has been hired by the pub. That person almost always has a second, or partner that they play with regularly, and together, they keep things flowing and interesting, which keeps the patrons coming back. They know every common, or popular tune which allows every one to play along, while constantly introducing new tunes. Occasionally, they will be the only ones playing. The session leaders are also working. They are hired by the pub and being paid to have high quality music on a daily basis to attract patrons. They are working to pay their mortgages or rents, so trying to take over a session is not very considerate. There is no ‘rule book’ for sessions in Galway. Trad musicians know how to conduct themselves without one. Etiquette means respect. Respect for the session leaders, the pub, the players sitting next to you, the people who come to listen, and especially the music. The leaders here are so supportive and accommodating to every one, they deserve respect. We joke amongst ourselves here in Galway about how Trip-Advisor has sold our town as the go-to place to check playing in a trad session off your bucket list. Just bring your guitar with limited ability and ‘jam’ during the trad tunes. Have family get photos. Maybe sing some Americana. The locals love it. It’s great craic! I just returned from our regular Tuesday half five session at Taaffe’s, led by George Grasso, originally from Santa Cruz, on banjo, and his session partner Simon on Guitar and vocals. Also there were some Tuesday regulars, Brendan on Guitar and banjo, Javier on Banjo, Ben on pipes, another Brendan on whistle, and I was playing bouzouki. We look forward to Tuesdays because every week George will have each of us start a set. It allows everyone to add in a few favourites, and keeps us on our toes to have an interesting set ready. The first set, three jigs, was a great start, and so George went into some reels. Suddenly, a visitor started playing guitar quite loud, fumbled for chords and started to derail the music. No one gave out to him, but I could see that no one was pleased either. Everyone had a cringed look, trying to get through the set. His guitar playing became progressively more complicated, bad dad gad, and continued for two hours. Aside from a couple of Carolan tunes that he didn’t play on, the session was quite strained, like pulling a ball and chain. Still, no one gave out to the guy. I started playing rhythm guitar over 60 years ago. I liked it so much I just kept doing it. But when I started learning trad, I switched to bouzouki and mandolin, both tuned G D A E. I knew that I had gotten bored playing rhythm guitar in rock, so I would probably get bored playing rhythm on it or bouzouki. Most of the tunes I was learning had only two, three, maybe four chords that fit anyway. Boring. Absolutely no room for creativity as far as I was concerned. No D A D G A D noodling for me. Until I got a four string instrument, then put in the time practicing and learned some trad tunes, I didn’t know what I was missing! Trad music is very basic, stripped down to the core. Any sheet music you see will only have one treble clef line. Check on The Sessions or JC’s ABC Tunefinder. There are no harmony lines, no bass lines. One melody line only. Two, three, four or more parts, but only one line of melody. No introductions, no endings. One line of notes. Nice and simple. A chord progression has three notes at a time. If a melody line only has one note at a time, two notes of the chord are not in that melody. Chords played prominently are a distraction from the melody. Chords played loudly create a muddy bottom that the music gets stuck in. It really does not make the music better. Practice at home, not in public. Noodle at home, not in public. Fish for chords with recordings at home, not in public. Instead of starting sets to show what you got, buy a pint and say hello. Join the craic. The session leaders are good at what they do. You don’t need to start sets, that is their job. They have been doing this all their lives. Remember, there are 100,100 Irish children who are better at trad music than you will ever be, so stop, listen and learn. Galway has the National University of Ireland, Galway, NUI Galway, and several other major colleges including MIT and GTI, all with music departments. Galway also has a great community trad music school, Dusty Banjos. It’s also a major tourist spot on the ‘Wild Atlantic Way‘, and is therefore a high transit area with eclectic musical tastes. O’Neill’s 1001 Dance Tunes Of Ireland, still the Bible, is a lifetime of learning and available from Waltons in Dublin, https://www.waltons.ie or Amazon. Comhaltas ‘Foinn Seisiún Book #1 – 4’, are 4 Sheet music books with CDs, and available from https://comhaltas.ie in Dublin. Dusty Banjos 400+ Trad Tunes played in The West of Ireland is available at: http://www.irishtunebook.com. Now! Go home and practice! Ranging from festivals such as Celtic Connections, theatres, folk clubs, and more recently house concerts, there are many venues in Scotland where traditional music can be enjoyed. One tried and tested way to experience or participate is to attend a music session. Frequently these musicians are unpaid and under no obligation to attend. However sometimes, an experienced musician is paid to lead a session and to encourage others to join in. So just how popular is the traditional music scene in Scotland? I spoke with a number of people involved in the scene including musicians, organisers, and promoters and the following points emerged. The participating audience tends to be in the older adult range. There is a real lack of adequate funding available. Emphasis has moved more to instrumental music at the expense of song. Although there is no doubt that younger musicians are participating, the typical audience appears to be of an older age group. Lack of adequate funding was also highlighted. A fact reflected in a recent survey published by “The Traditional Music Forum”. However there are institutions such as The Royal Conservatoire of Scotland which are training establishments for the performing arts. (They have a Facebook page). Many of the musicians I spoke with, some well respected and well known in the Scottish folk scene, felt that the emphasis had moved too much towards instrumental type of music. Indicating that the roots of folk music lay in song and participation of audiences. In conclusion the Scottish Folk Music Scene appears to be alive and thriving. Many young musicians are carrying the music forward for future generations to enjoy. 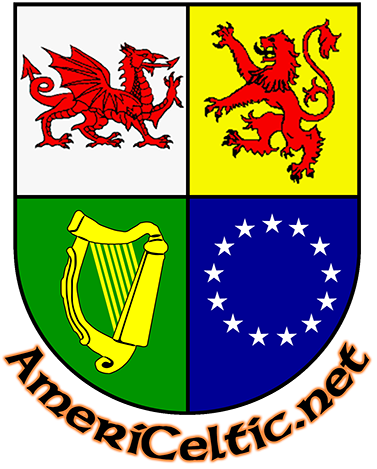 There are many supporting organisations to be found such as The Traditional Music and Song Association. Social media has become a platform and support tool with many groups and pages dedicated to supporting our tradition. 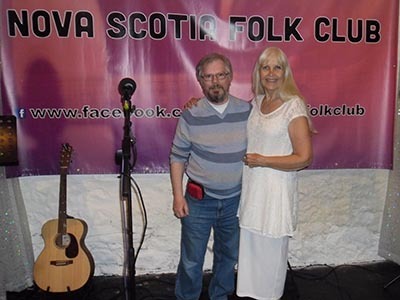 Festivals are many and folk clubs, house concerts, and sessions are well attended. Speaking from the owner/operator side, once again, there are NO hard and fast ‘rules’ for sessions. The protocol is best kept between each particular establishment and the particular group of musicians that come in to play and sing. 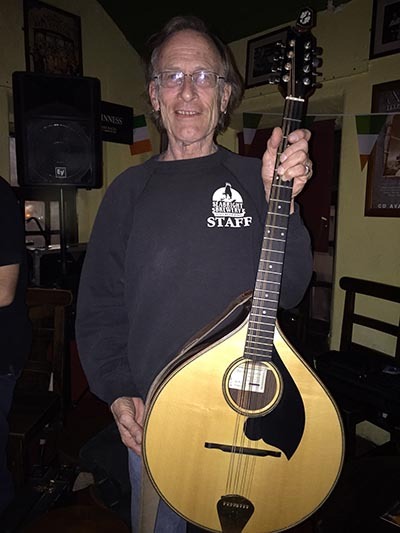 Shay Black was a founder of the Sunday Irish session at the Starry Plough in Berkeley, CA, and here he writes down some thoughts about rhythm instruments in tune sessions. I am a guitar player and run an Irish session on a regular basis. It is an open session, which means open to anyone that wants to join in, provided they already know how to play Irish traditional music. There is an unsaid institutional knowledge in session etiquette, and I will attempt to give my take on it. Irish music sessions are usually characterized by everybody playing lead, all the time. There actually is no traditional harmony, as Irish music does not have a history of rhythmic background structure per se, apart from some classical Carolan or harp tunes. Sean O Riada and Paddy Moloney from the Chieftains were initiators of harmonic settings to tunes, eventually developing into the music of great revivalist groups like The Bothy Band. As rhythm players, we first need to be cognizant of the fact that very many Irish session players want NO rhythmic accompaniment. They can find it off-putting, intrusive, distracting, off-beat and often just plain wrong. When joining a new session, it is often a good idea to check in with the lead players to see if it is acceptable to join, and do not be miffed if the answer is no. However, if you are welcomed, there are a few common-sense rules to which you should adhere. First off, know the tune. That last half-sentence is important. There is nothing worse than sitting beside someone who is a ‘noodler’. Noodling is trying to keep up (and failing) because others are playing faster, not knowing the tune and guessing at it, or if you are playing a lead instrument, playing ‘ad lib harmony’. Musicians love it if the guitar player plays ‘lead‘, in that they are playing tunes like a mandolin or banjo player, i.e., keeping up and actually playing the notes of the tunes. Please, people, do not noodle. If you don’t know a tune or can’t keep up, don’t play. It spoils it for everyone. Do not guess chords. Secondly, if you join an open session, be aware if there is another rhythm player amongst the players. If this is a regular accepted session member, learn from him or her. It is polite to at least acknowledge them. As a guitarist, you are not like a fiddle or flute player joining in and playing the tune; you are hearing chordal structure behind the music and whatever you are playing, it should be virtually identical to what the usual accompanist is cranking out at that moment. Position yourself in the session so that you can watch their fingers, and maybe even ask if they are playing ‘standard’ tuning, dropped D or DADGAD. It matters and it will help you follow the chord structure, as played. In my band (The Black Brothers) we have banjo and fiddle playing lead, and I play guitar backing, but we also have a piano and sometimes cello and we spend a long time working on backing chords that do not clash with each other, or the music. Although you are usually playing chords, you are also adding ‘beat’ to the session. Try and develop your chordal rhythm. Do not be the ‘dead hand’, simply playing a three-chord chunka-chunka so that you are at least playing …erm… something? Note other musicians’ body language. Most are too polite to say that you might be spoiling the session for them, but if you see people squirming in their seat as soon as you join in, or they are looking uncomfortable, maybe you should back off in volume, or otherwise be more aware of your contribution. If you are not adding to the session, stop and have a break. Stand close by and listen to the others for awhile. Note the bodhran players. Are they an integral part of the session, or are they sitting on the periphery just trying to keep up? If it is the former, listen to them. Your rhythm should be in sync with them. If it is the latter and the bodhran player is a learner, then watch the main musician or the person who starts the tune and follow their pace. Often they will tap their foot in rhythm. Follow that, and don’t fly off into a fugue of rhythm and speed and chords that drowns or ignores everyone else. Less is more in this case. Listen to the work of Denis Cahill, who plays with Martin Hayes. He is slow and sensitive, yet fulfilling. In the open session at The Starry Plough, how the music sounds can sometime depends on who walks in the door carrying a guitar. It can be a blessing or a curse. With any session, always check it out before you even take out an instrument. Record the session and listen to it at home. Work out who sits where and who is running the night. Introduce yourself, if it’s appropriate. Note the tonal landscape that musicians, who are used to playing together, are trying to create. Newcomers can sometimes, in their enthusiasm, blithely guess at chords. Yes, the basic chords add rhythm to the music but when some musicians are playing different chordal harmonies than those usually played, it can be a clamorous unmusical clash. Listen to see if that is happening, or is it a balanced blend of instruments, with the tune soaring above everything. When it doesn’t happen, other lead musicians get impatient. I do, and I will sometimes ask some players to play less stridently. I try to share chords with other rhythm players. If I think someone is struggling, or makes it clear to me that they are checking what I am doing, I will sometimes strategically place myself in a place where they can see my fingers. Often I will back off on a set of tunes completely, put my instrument down, and give another guitarist full rein to play their own chords without my interference, and build their own musical backing. For me, it is mind-opening and welcome to hear a innovative chordal backing of a tune with new chords that that I have not heard before. Experienced rhythm players can actually bounce chords off each other once they are familiar with each other’s style, by playing on the half-beat, or in other ways filling in gaps. Some sessions, like Jack’s (below), prefer to have one designated guitar player and bodhran player. It’s good practice to check theses things out in advance. With bodhrans, just because one is great doesn’t mean two is more great. I have heard sessions where there are excellent tune players, but all one can hear is an amorphous white noise because of the multi-bodhrans thumping away. Bodhrans are instruments that, played well, are succinct and rhythmically pleasing. They are best played under the music, giving it crisplift and pace, not drowning it with thuda-thuda noise. In my own session in Berkeley I have sometimes been accused of suffering fools too gladly. My line is that we are all on a continuous learning curve, and people need a place to play. At an open session sometimes impatient musicians can vote with their feet if they don’t want to play alongside a noodler, or a thumping bodhran, or insensitive guitarist. People are very sensitive around the issue of talent and musicianship, and with whom they want to put in their time and effort. I try to walk a line of fostering a good session, while encouraging developing musicians. I personally prefer critical tolerance of learners, and I recognize that beginners sometimes can’t hear that what they are doing doesn’t quite add to the final product. I know this can be very subjective, but I believe the rule of thumb could be new players striving to play softer when in a learning situation, using less pick or plectrum, and as ever, try to learn from more experienced musicians. Over time skills improve and this adds to the session. Consider also joining slow sessions, or work with other tune learners so that there is familiarity in playing some of the standard tunes. In many sessions across the world, here have been tears and harsh words and walk-outs and flame email wars. 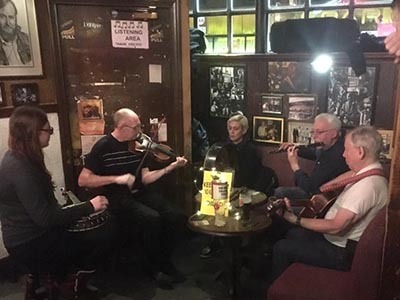 But don’t be disheartened: we have been playing an open Irish music session in The Starry Plough on a Sunday night for over twenty years and, most times, it’s exciting and really great fun. Of course, the occasional song adds to the bright mix. Once you become really enthused, think about starting your own session with friends, and this becomes a cross-fertilization of talent. We can’t have too much Irish music, and diversity in styles, leadership, levels of accomplishment, and types of instruments are very welcome in the genre. Remember to be sensitive about how you are playing, be realistic about your own talent, and be prepared lay down your instrument sometimes during the night to give others a chance to shine. If you play by ear only, you will never have that same depth of understanding (of) music construct. I fear that millions of traditional musicians who might benefit, instead will react with abhorrence and read no further. 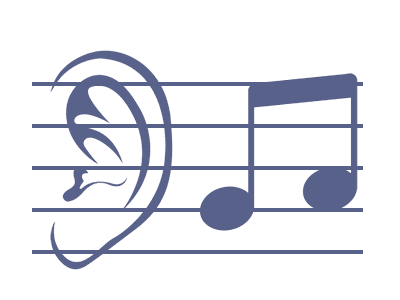 In opposition, some traditional music session hosts ban the use of sheet music, thereby restricting who is allowed to participate and offending all who have developed these skills. The ban and restrictions are generally not a matter of space and conditions. Certainly a small crowded pub, or a windy open air site where sheet music stands can blow over and sheet music away and both can get in the way of passersby would not be an appropriate place for them. But this is the exception. Why do you think players continue to divide into such hostile doctrinal camps in this age of growing diversity? Is it because they fear change, and so feel the need to defend their group from the intrusion of those who have other views, or are they simply afraid of the possibility of any competition? There is plenty of common cause between these two groups, ‘written’ and ‘by ear’. Across the world, traditional music, song and dance represent the traditions and customs of a culture, rather than so-called international music which can be heard all across this planet. With the globalization of all things, every young person should be encouraged to love and engage with their own traditions to keep their cultural heritage alive. It seems to us there is value in both approaches. Rather than ostracize each other over the means of preserving our distinct cultures, shouldn’t we focus on the larger issue of their homogenization into an indistinct globalized one? 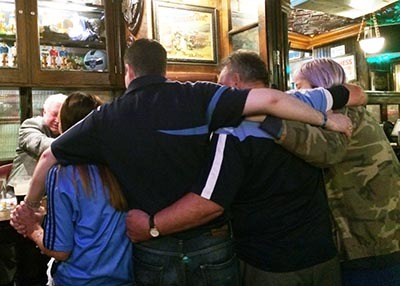 In our opinion, and that of many others, one of the values of traditional Celtic culture is the way they integrate their music, song, dance with their socialization in settings like the traditional Public House (Pubs), and Celtic Festivals like traditional Fleadhs. …parents should encourage their children to play an instrument because it has been proven to help in brain synapse connections, learning discipline, work ethic, and working within a team. By playing, he means also learning to read music, not just experimenting with where to put the fingers on an instrument and learning from others solely by ear or watching where others put their fingers and hoping to remember more than a few notes. When you are dealing with tradition, it really becomes a slippery slope to attempt critique, as many decisions of tradition are relative to your perspective. I see advantages to both systems, and to students of music in the west I strongly encourage immersion in both practices, as the mark of a great performer is versatility. This is America. Let’s all support, and take full advantage all our diverse, distinct cultures and techniques, combining all our bests, for the good of all of us.